UPDATED: Tue., Jan. 30, 2018, 11:11 p.m.
WASHINGTON – President Donald Trump was overheard Tuesday night telling a Republican lawmaker he is “100 percent” in favor of releasing a classified memo on the Russia investigation that has sparked a political fight pitting Republicans against the FBI and the Justice Department. Television cameras captured the exchange as Trump was leaving the chamber. The White House had said before the speech that it was still conducting a legal and national security review of the document, and press secretary Sarah Sanders told reporters earlier Tuesday that Trump still had not been briefed on its contents. The memo arrived at the White House on Monday evening after Republicans on the House intelligence committee brushed aside opposition from the Justice Department and voted to release it. Under committee rules, the president has five days to object to its release. The four-page memo was written by Republicans on the committee, led by chairman Rep. Devin Nunes of California, a close Trump ally who has become a fierce critic of the FBI and the Justice Department. Republicans have said the memo reveals improper use of surveillance by the FBI and the Justice Department in the Russia investigation. Democrats have called it a selectively edited group of GOP talking points that attempt to distract from the committee’s own investigation into Russian meddling. On Tuesday, House Speaker Paul Ryan said he supports the memo’s release but doesn’t want Republicans to use it to attack special counsel Robert Mueller, who is investigating Russian meddling in the 2016 election and whether Trump’s campaign was involved. “This is a completely separate matter from Bob Mueller’s investigation and his investigation should be allowed to take its course,” Ryan said, noting that he also supports Deputy Attorney General Rod Rosenstein, who oversees Mueller. Ryan said the memo shows “there may have been malfeasance at the FBI by certain individuals.” He did not provide additional details, only saying that “there are legitimate questions about whether an American’s civil liberties were violated by the FISA process,” a reference to the Foreign Intelligence Surveillance Act. It’s unclear how FBI malfeasance could have solely resulted in a judge signing off on a FISA warrant. Applications for such warrants are submitted by Justice Department lawyers before a judge of the Foreign Intelligence Surveillance Court. Those lawyers would have to authorize and ultimately prepare any filing that is made. The vote to release the memo is an unprecedented move by the committee, which typically goes out of its way to protect classified information in the interest of protecting intelligence sources and methods. It also came after Rosenstein and FBI Director Christopher Wray warned White House chief of staff John Kelly that releasing the memo publicly could set a dangerous precedent, according to a person familiar with the conversation. Rosenstein and Wray voiced their concerns personally to Kelly during a meeting at the White House on Monday ahead of the vote by the House intelligence committee, said the person, who wasn’t authorized to speak publicly on the matter and spoke on condition of anonymity. Rosenstein also told Kelly the memo didn’t accurately characterize the FBI’s investigative practices, the person said. The Washington Post first reported the details of the White House meeting. The FBI and the Justice Department declined comment. The Justice Department had said in a letter last week that it would be “extraordinarily reckless” to release the memo without first giving the FBI and the department the chance to review it. But Rep. Adam Schiff of California, the ranking Democrat on the committee, said Wray told him Monday that the review didn’t satisfy his concerns about the memo’s release. Wray wanted to brief the committee about FBI and Justice Department concerns ahead of any release, a request committee Republicans blocked, Schiff said. On Tuesday, White House press secretary Sarah Huckabee Sanders pushed back on reports that the release was imminent, saying the White House has no “current plans” to do so. “The President has not seen or been briefed on the memo or reviewed its contents,” she said. A senior White House official said the National Security Council is leading an interagency review of the memo. If Trump decides to release the memo, it could be made public as early as Wednesday afternoon, said the official who spoke on condition of anonymity to discuss confidential internal deliberations. So far, the official said, the Justice Department is the only agency opposing its release. Asked Tuesday about the department’s position on the memo’s release, Justice Department spokeswoman Sarah Isgur Flores declined comment. Republicans said they are confident the release won’t harm national security. They also said they would not release the underlying intelligence that informed the memo. “You’ll see for yourself that it’s not necessary,” said Texas Rep. Mike Conaway of Texas, who’s leading the House’s Russia investigation. 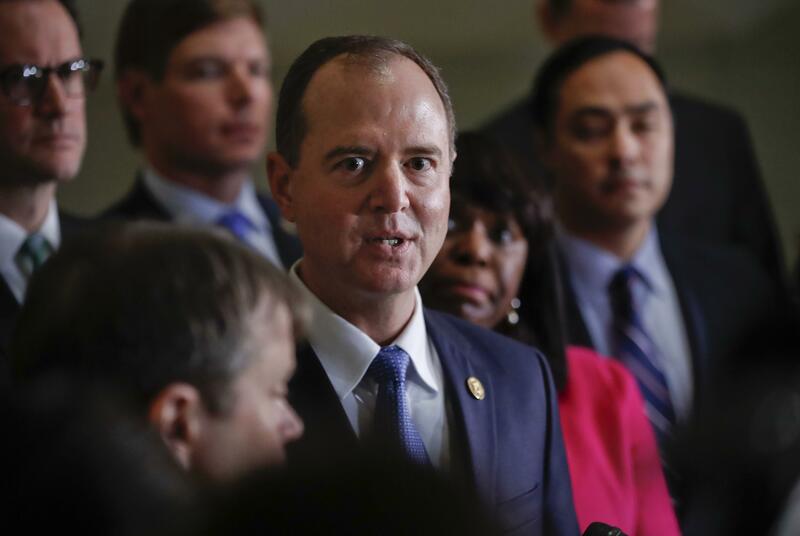 But Schiff said the memo’s release could compromise intelligence sources and methods. Some Republican senators have also said they don’t want to release the memo, and Democrats have pushed back on Republican criticism of the FBI, saying it is an attempt to discredit Mueller’s investigation. The probe has already resulted in charges against four of Trump’s former campaign advisers and has recently moved closer to Trump’s inner circle. In response, Democrats on the panel have put together their own memo. On Monday, the committee voted to make the Democratic memo available to all House members – but not the public. Conaway said he was open to making it public after House members have a chance to review it. Separately Tuesday, the House committee’s interview with former White House chief strategist Steve Bannon was delayed, according to two people familiar with the decision. The people spoke on condition of anonymity to discuss private committee deliberations. Bannon was set to be interviewed behind closed doors Wednesday. But one of the people familiar with the decision to delay it said it was premature to schedule it this week because discussions have only just started with the White House over what Bannon can tell the committee. Published: Jan. 30, 2018, 9:36 a.m. Updated: Jan. 30, 2018, 11:11 p.m.
new ‘Jeopardy!’ winner James Holzhauer keeps dominating. Does it matter if he broke the game?